You are currently browsing the monthly archive for October 2005. I started cozy last weekend, for my husband’s grandmother. I’m not sure I can stick with it for a zillion inches…I may have to change it up a little. Also, I’m using WoolEase, so it’s not super scrunchably soft…but I just can’t make her something that’s not machine washable. Won’t work. Couldn’t find anything sufficiently cozy that didn’t require special care. Also — yes, I’m skipping FO numbers. The missing FOs will remain in my draft folder until after Christmas! At last!! 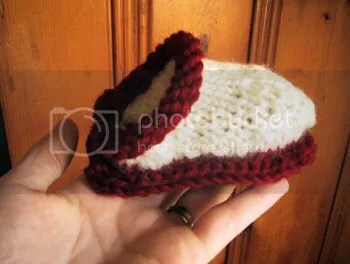 Really, the knitting just took a few days. I just put off sewing the collar and the buttons for *eons*. 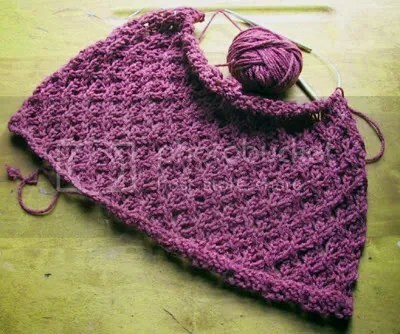 While this was on the needles I thought it was gonna turn out kinda ghetto, but I really, really like it on. If I could do it again I’d make the sailor collar a widge longer and four stitches wider…but all in all I’m pleased. It does need a simple edge on the bottom (pick up then bind off) but I’m couting it as done since I wore it to church this morning. Zip-Front Cardigan with ribbed sailor collar. No pattern — just me and my measuring tape and that crazy KMW. 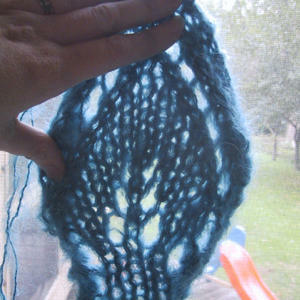 Knit in some mystery cone yarn I got on eBay, 55% wool, 45% acrylic. The photo makes it look grey, but it’s actually a natural/loden green tweed-ish yarn. Bulky weight. 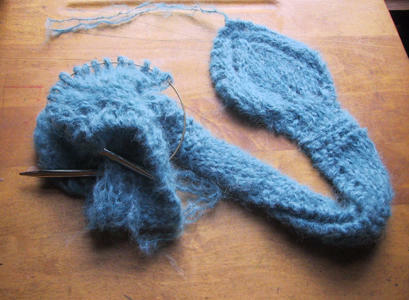 Knit on 16″ and 24″ US13 needles. 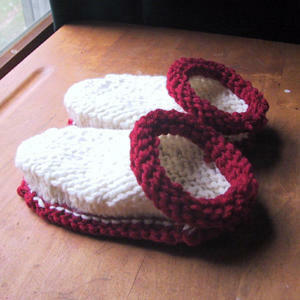 Children’s Fiber Trends Clogs, size small. Knit in Knitpicks Wool of the Andes, Natural and Cranberry. 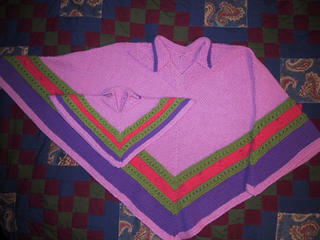 I have finished Hell’s Poncho, and lived to tell the tale. Knit in Knitpicks Merino Style (Petal, Asparagus, Rhubarb, and Iris) on US6 needles. Pattern modifications: I wanted to make the poncho for an American Girl doll instead of a Barbie, so instead of using lighter weight yarn for the doll’s poncho, I used the same weight as the girl’s. Worked out perfectly. Started 8/20, finished 10/09, (all but the embroidery, that is). 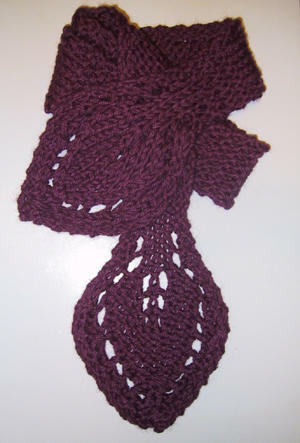 Obviously, I really like this scarf pattern. Ironic, because I’m not a fan of scarves in general. Before these three, I’d only knitted two scarves, and they bored me to tears and I swore never to make another scarf. I’ve always thought of scarves as something to “get past,” I guess…not something I’d actually look forward to knitting. 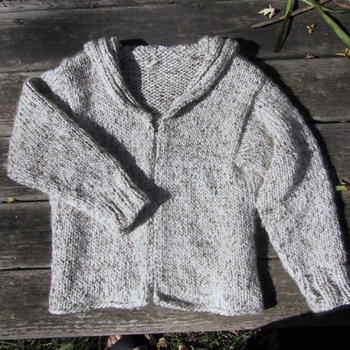 So, totally surprising that I would voluntarily PAY for this pattern (I don’t usually buy loose patterns either), and knit it three times in a row. I know, in this picture it’s not finished.But it is, really, I was just too lazy to take another one. Knit with yarn doubled, on US13 needles. 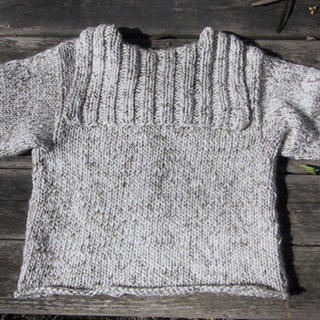 Started 9/25 (then ran out of yarn, ordered yarn…), finished 10/01.